In the past few months i've been regularly asked by my friends about one particular beauty product: it did such a brilliant job on my nails, and saved so much money that otherwise would have been spent on manicures. My many friends, colleagues wanted to know immediately what this miracle product was and where exactly they could buy it. So if you do stick to the routine and continuously apply this product, day in day out, morning or evening, then in a few days you are guaranteed to get very pretty, neat and polished nails. 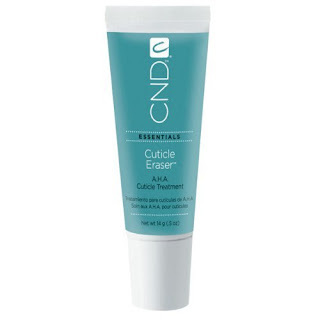 This product is the best i ever used for my cuticles, and it's called CND Cuticle Eraser. I regularly get my supplies from this (amazing) cult beauty products site. They deliver from the UK to the majority of the European countries, the service is always excellent, fast and efficient. And by the way, Cuticle Eraser goes very well with this sheer sweet pink Essie nail polish called No Pre-nup.